A secret sign of Christianity becomes an open display of faith on Christian Wedding rings. It has long been known that the sign of the fish was used by Christians to identify themselves to each other in secret, in Roman occupied Israel in biblical times. Now the converse is true; as well as the cross, the fish is often engraved on Christian wedding rings an open sign of the commitment between two people getting married. 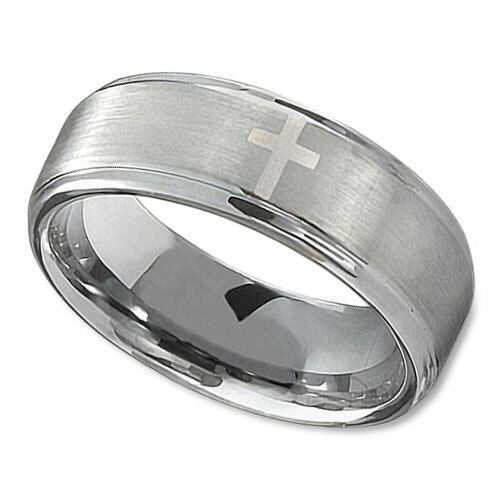 Pictured above is our most popular Christian Wedding Ring. This has a beautiful etched cross in the ring. As this is made of Tungsten, it will last a lifetime and not scratch. To view more details and order this ring, click here. For all couples embarking on the road of marriage the ring is important, never more so for Christians who make their commitment before each other and before God. Biblical descriptions of Christian marriage is about becoming one with each other, thei rings remind them not only of their pledge to each other, but their commitment to Christ the person at the center of their faith. The wedding ceremony itself has a biblical significance. The bible describes Jesus as the bride groom who will marry the bride His church. The rings serve as a constant reminder for Christians that they will be united with Jesus in eternity, becoming one with him, just as they have become one with each other. The circle of the ring is a symbol of eternity, no beginning and no end, can now be completed with signs of their Christian faith engraved onto their rings. The cross at the heart of Christianity openly displays their faith to each other, and to those around them. The fish no longer a secret sign written in the sand, now a bold statement of the couple’s Christian belief, openly displayed on their bands. 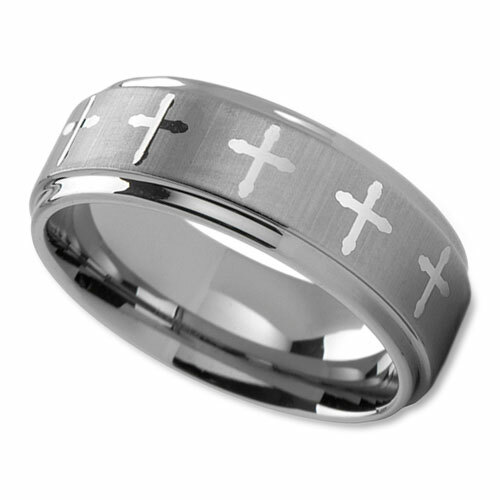 Pictured above is our Christian Wedding Ring with Repeating Crosses and Brushed Finish Center. To read more about this ring and buy it, please click here. Some choose to have a scripture engraved on the inside of their bands. A favorite is 1 Corinthians 13, which outlines the virtues of love, which is at the heart of every marriage. The ring is the most lasting of the marriage items. It quietly serves as a reminder throughout the marriage of the promise made whether that promise was made a few months earlier or 50 years earlier. For a Christian, scripture from the bible is one of the most important parts of their faith, and to have a constant reminder engraved on their bands seems to be a perfect choice. The wedding band is considered in some cultures as an imperative part of marriage, as it is a sign of commitment and fidelity to your partner, for Christians this goes one stage further with an open commitment to only follow the teachings of Christ, a fidelity to the gospel. The marriage ceremony is a ceremony based on trust, largely made up of words that express an intention of a pledge. Sometimes words can be forgotten, but for Christians, the rings that a couple give to each other with good intention, can act as a reminder that not just intention is needed but action as well.